Words matter. When things happens in politics, the tone of how events are reported, the words that are used, and the way situations are framed are not organised by random. The mainstream media chooses the words they use very carefully. Today the media have presented their preferred frame for the resignation of Barry O’Farrell as: he mistakenly lied to an ICAC enquiry because he forgot that he received a $3,000 bottle of wine from the CEO of Australian Water Holdings. But of course O’Farrell didn’t resign because of his problems with ‘memory’. He resigned because he could no longer deny a personal expensive-wine-recipient, hand-written-note-receiver, phone-call-taker-relationship with someone who was earning over a million dollars a year as CEO of a company in a public-private partnership with the government Barry O’Farrell was in charge of up until today. This information is completely absent from the media’s framing of this story. But just imagine for a moment if one part of this story was different. 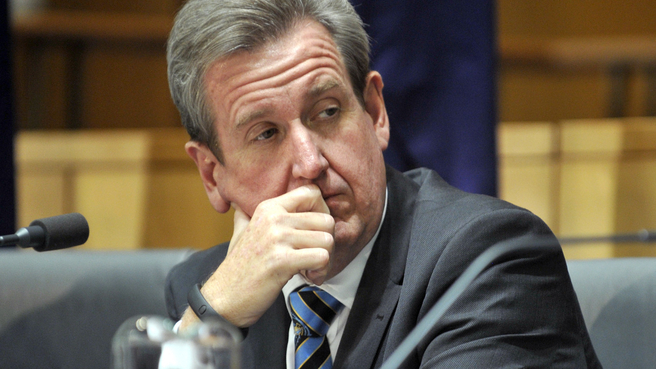 Imagine for a moment that Barry O’Farrell was a Labor Premier. Imagine if Tony Abbott, standing by O’Farrell and brawling with a journalist asking questions about corruption, was a Labor Prime Minister. The ‘chaos, scandal, dysfunction, smear’ machine works in overdrive for Labor stories, but can’t even get out of second gear when Liberals are involved. Does everyone remember when Julia Gillard apparently had ‘questions to answer’ over her very long time ago ex-boyfriend’s alleged involvement in a union ‘slush fund’? I’m sure you remember the media circus around this apparent scandal surrounding events 20 years in the past. According to a search of newspaper articles from the last three years that mention ‘slush’, ‘Gillard’ and ‘awu’, there were 923 articles written on the subject, of which 373 were contributed by The Australian. When I did another search and took out ‘slush’ and ‘awu’, but left in ‘Gillard’ and added ‘questions to answer’, the search revealed a whopping 4,017 articles, of which over 1,000 were from The Australian. Obsessed much? And even after Gillard bravely spent an hour answering every question the press could think of, even when they ran out of questions, there were still apparently ‘questions to answer’. This Labor ‘chaos, scandal, dysfunction’ story was salivated over by the mainstream media for three years, yet Gillard was never found to have done anything wrong. You would think journalists would learn not to take story advice from deluded creatures like Larry Pickering. There is no better example than this of the huge gulf between the way the media reports apparent scandals involving Labor politicians, compared to real scandals involving Liberal politicians. Remember the way NSW Labor MP David Campbell was treated after he was stalked by Channel 7 and filmed going into a ‘gay’ sauna (is that illegal?). What about the way Craig Thompson’s story dominated the news after he allegedly paid for prostitutes on a work credit card years before he was in parliament (2,127 news articles mention ‘credit card’ and ‘Craig Thomson’). Or the reporting of ex-Liberal and independent-yet-linked-to-Labor-as-Speaker Peter Slipper’s scandal over private text messages, alleged sexual harassment of James Ashby (which was later exposed by Justice Rares as a spurious case) and the misuse of travel claims (which were fractional compared to Abbott’s own misuse of travel claims to sell his book Battlelines for private profit). There is absolutely no doubt that the mainstream media revel in anything that even looks like belonging to Labor with even the hint of a scandal, no matter how inconsequential, and how much reality can actually be assigned to such apparent scandal. But when it comes to blatant scandals and corruption, right in the very heart of the Liberal Party, the oh so familiar ‘nothing to see here, move along’ attitude is rolled out by the media, mixed with ‘you can’t trust any politicians’ line to make sure Labor gets smeared at the same time as Liberals. Even when two people from opposing sides of politics are both involved in the exact same scandal, the way the media treats their ‘Labor’ version of the scandal, as compared with the ‘Liberal’ version, is quite clearly not the same. An example of this is former NSW Labor member Eddie Obeid and current Liberal Senator Arthur Sinodinos. I checked how many times newspaper articles mentioning the words ‘Obeid’ and ‘scandal’ also included the word ‘Labor’ and I found all three words included in 89% of cases. I did the same thing for ‘Sinodinis’ and ‘scandal’ to see how many times the word ‘Liberal’ was included with these two words. The result was 74%. Words matter. And apparently the words ‘Labor’ and ‘Liberal’ matter the most. The media seems to think there is more coming, and it goes right up to Abbott. Nice to see many chickens coming home to roost., Trouble is, I think that O’Farrell might have put some restraints on Abbott. He did back Gonski and NDIS for starters. It does not matter how you polish it, but a crook is a crook is a crook and the lnp is full of them. Of course guddy they just haven’t been uncovered as yet. The ‘chaos, scandal, dysfunction, smear’ machine works in overdrive for Labor stories, but can’t even get out of second gear when Liberals are involved. Definitely double standards by the Australian Media executions, when dealing with the name brand Labor who are publically hung and quartered daily, while the Liberal and National Party coalition team get off scott free with the get out of jail bonus thankyou card. When will the Australian voting public wake up to themselves. Great article Vic and love the way you have including information backing up your facts about the Australian Media bias against the Labor political party and how the media are still out to crucify Julia Gillard. Victoria you have put together a very good prima facia case containing the burden of proof revelling just how biased those MM’s morons are. If a politician does break our laws, like Graig Thompson then it is for the courts. while Geoff Shaw case was similar for miss use of a credit card but got off scott free. Even Tony Abbott has breached some of those guide lines when using public funds for his own benefit. Abbott should have known that he was deliberately ripping off the system. Again double standards applied by our Media. Everybody is missing the real story here. I’m more interested in how ICAC were made aware of the existence of the wine in the first place. Who else knew about the wine? Who knew about the delivery details – the date and the courier involved? Why would Di Girolamo hold onto the thank-you note for all those years and how did it make its way to ICAC? Who stands to gain from all this? Certainly not O’Farrell or Di Girolamo. Why didn’t O’Farrell’s minders jump on this when it was first reported in march? I don’t accept that “sh*t happens” in these circumstances or that O’Farrell had a major memory loss. He could have taken the “I don’t recall” option at any time. It seems to me that there are strange things happening in the “corridors of power” in the Liberal Party, or do O’Beid & Co have far more influence than they seem. The fate of O’Farrell may be just the first in a series of unintended consequences of this investigation. I wonder where it will lead next? Firstly the real story is Arthur Sinodinos has not resigned from parliament. Victoria, you have a point. But your article does sound very partisan. In NSW we have had Obeid, Tripodi, Woolongong council and a whole raft of State government corruption cases. Sadly I feel that this reflected poorly on Julia and her federal government. Yes, the media should go harder. However I believe Barry’s story, that he forgot. As you said he could have said “I don’t recall” or “I will get back to you”. He could have also ran to the election and probably would have retained power. It is good to see a politician actually admit wrong and resign. “What about the way Craig Thompson’s story dominated the news after he allegedly paid for prostitutes on a work credit card years before he was in parliament (2,127 news articles mention ‘credit card’ and ‘Craig Thomson’)”. As others point out above, Craig Thompson was found guilty. Worse he was preselected knowing that this scandal was about to enfoil. He betrayed his Union and the low paid workers he was meant to fight for. Please put a correction to your article, it is not helping your point. I read your balance article Victoria about those simple minds and I agree there are a lot of dumb arses around these days. Waleed Aly definitely got the bug attack over O’Farrell’s loss of memory. No doubt this disease comes from his mate Abbott who would be lost without his minders. Thats right the issues you mention are done, the blowtorch is on the lnp now,Artie your next mate. That’s alright guddy, I do those little typo’s all the time. Words do not seem to have the same meaning to some people, Well those in the Coalition seem to have given many words new meanings. Words do matter, but only if we give them all the same meaning. Take the word “lie” for instant. To say that PM Gillard lied about bringing in t5he CEF suite of bills, is taking the meaning of this word to new heights. When they use the word to describe promises, it does not seem to mean they same, as it does to many of us. Same goes for the word “openness”. so are you giving the coalition the same free pass that labor expected with the carbon tax, in the name of consistency? labor made it clear and unambiguous that there would be no carbon tax. the LNP were verballed on the likes of cuts to the ABC in that the full quote indicated that waste would be up for grabs. Go find and read the full door stop speech for a change. Even-though Julia had said that there will be no carbon tax during that particular speech, she did say at the end of her statement that there would be a carbon trading scheme pricing instead. Now at the end of the speech, Bob Brown was heard to say; Oh yes she will! The media cut all this out. It was Bob Brown who kicked her into the agreement for the carbon tax to form government and your mate Abbott was willing to agree with Bob for the carbon tax anyway if he done a deal with him. But Bob didn’t trust your mate Abbott. Then after that It was your stupid Tony Abbott started calling it a carbon tax day in and day out without telling the real truth about the carbon tax which was only to be a interim introductory before the Carbone Trading Scheme really got off the ground. So get off you lying merrygoaroundill and find the truth for a change. I remember seeing her on the clifftops in brisbane giving the speech in question. do you have a link to the full speech? in which universe did you think the greens would ever go into coalition with the LNP? Local paper;. Central Coast. Wyong Express Advocate. Three of our four main MPs sidelined for leadership battle. Yes all is indeed sweet in the land of the Coalition.